Hey! Are you laughing at my toes? This entry was posted in Travel Photos and tagged 50 Year Project, Birds, Coot, England, Hyde Park, Life, London, Nature, Photography, Travel, Travel Blog, Travel Journal, Travel Photo, Wildlife. Bookmark the permalink. Wow, the toes look like feathers… how cool. That is fitting for him. Well the toes are rather odd. Or is that the water playing with a bit of distortion ??? What are these birds ?? They are Coots and I don’t think the water is distorting their toes. They really look like that. Oh and you need Pinterest, Google + and LinkedIn sharing buttons. Please…so I can share your photos there. Thanks for the tip. They should be added now. Let me know if there are any issues. Just smiling because they’re adorable! That is one unusual-looking bird. Interesting color placement. I think the toes are rather fancy. I’m sure he would prefer having his toes called fancy. Yes and it’s safe to say I’m not cool like this guy. Oh, that’s great! LOL – yes, I am laughing at its toes – what unusual looking feet! It reminds me of the snowy egret. 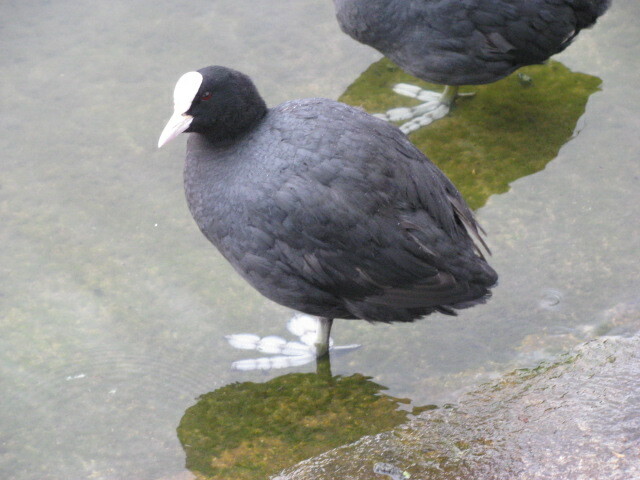 They have very bold, noticeable yellow feet and elegant white plumage. I’m not sure I’ve seen a snowy egret. It seems that the yellow feet would stand out for me.